We all need food to live. Sometimes we cannot eat enough food because of illness, surgery or difficulty in swallowing. In these instances, nutrition must be supplied in another way and one method is Enteral Nutrition. Enteral Nutrition is the delivery of specially formulated food products containing protein, carbohydrates, fats, vitamins and minerals through a tube into the stomach or small bowel. Enteral feedings maybe delivered in the tube by syringe, gravity or an enteral infusion pump. They may be given intermittently or on a continuous basis. 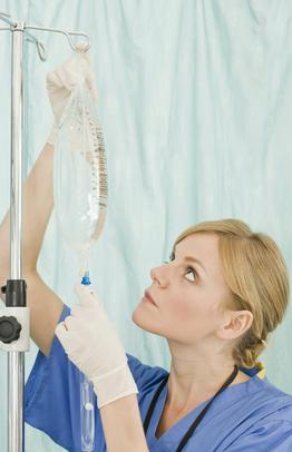 Parenteral Nutrition is the administration of the patient’s nutritional needs intravenously. Total Parenteral Nutrition (TPN) provides all of the carbohydrates, proteins, fats, water, electrolytes, vitamins and minerals needing for the building of tissue, expenditure of energy and other physiologic activities. Although this originated as an inpatient emergency life-saving technique following surgery for severe and massive trauma of the gastrointestinal tract, it has now become a relatively common means of providing bowel rest and nutrition in a variety of conditions. It has been used as a long-term therapy for selected patients on an outpatient basis. Parenteral Nutrition Formulation – Each patient has unique needs so every TPN is patient specific and will be adjusted frequently to address any changes in caloric and micronutrient requirements. Carbohydrates – preferred fuel for the Central Nervous System (brain) and red & white blood cells. They are a readily available energy source for cellular functions. Protein – provides amino acids necessary for the promotion & production of structural protein, growth, neuromuscular and immunologic function and it also fuels mental processes. Fats – maintains function of cellular membranes, provides padding to organs, insulation for the body. Fats are also important in blood clotting, wound healing and maintenance of skin and hair.